The Peacham Library’s Gilmore Gallery exhibition for February and March is Robert Van Vranken, a highly accomplished visual artist, and a recent transplant to Peacham from Brunswick, Maine. Mr. Van Vranken’s work has been featured in well known New York galleries for well over 20 years. He has participated in no less than 16 solo shows and over 30 group exhibitions in galleries from Seattle to Maine, and has taught at Princeton, the San Francisco Art Institute and the University of Maine. 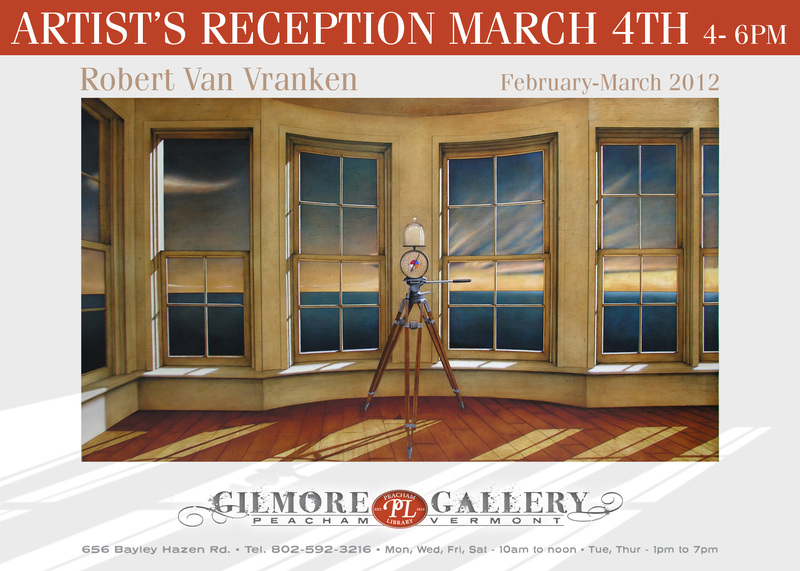 The centerpiece of the Robert Van Vranken exhibit at Gilmore Gallery is an impressive 47″ x 82″ oil painting that highlights Mr. Van Vranken’s painstaking attention to detail and technical skill, along with his extensive knowledge of light and shadow. It and several smaller pieces will be on display until the end of March. An artist reception will be held March 4 from 4-6pm. More information on the Gallery and the work on display may be found on the gallery’s blog.